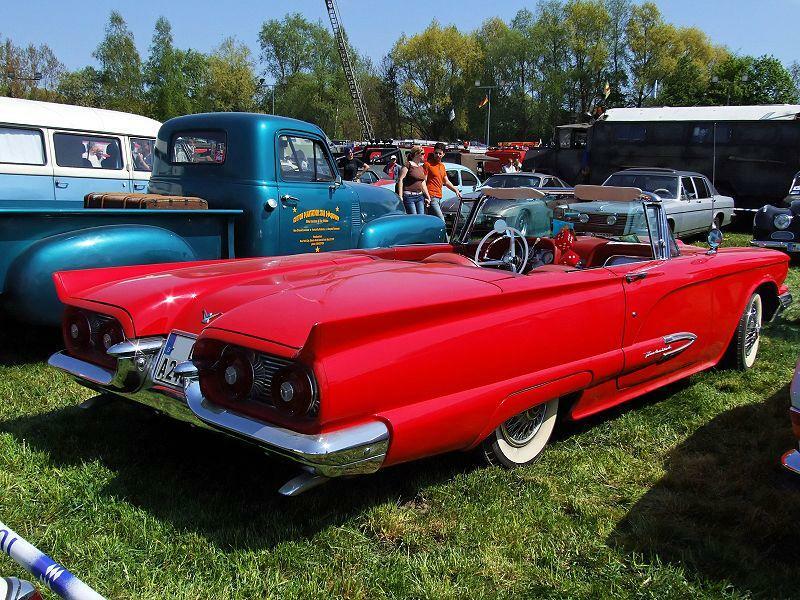 Purists were mad when an enlarged Thunderbird appeared in 1958 sporting a backseat, but Ford officials couldn’t have cared less; demand was soaring for the all-new “Squarebird.” Sales jumped a whopping 76 percent in 1958 to 37,892, and another 67,456 Thunderbirds followed in 1959, joined by 92,843 in 1960. 1958 saw the introduction of a hardtop model and a unitized body/frame platform similar to the construction used by Lincoln’s equally new Continental. The wheelbase increased to 113 inches, overall length went up 2 feet, and the weight jumped about a half-ton. To move this mass, Ford’s new FE-series 352 cubic-inch V-8 replaced the 312-cid Y-block. Lincoln’s even larger 430 cubic-inch V-8 became an option in 1959. A fully automatic convertible top appeared in 1959, followed by this country’s first postwar sunroof, a manually controlled hardtop option offered in 1960. The coils-spring suspension used in the rear in 1958 was traded for traditional leaf springs in 1959.